The bulk of manufacturing jobs in Phillipsburg have vanished, and the town is no longer a common destination for durable goods on their way to and from America's largest markets. Transitions like this are not news in most New Jersey urban zones, which have been dealing with vacancies for years, trying to make ends meet while people, and business, move to the suburbs. In 1994, the New Jersey State Legislature designated Phillipsburg as an Urban Enterprise Zone community, authorizing the provision of tax incentives and other benefits to businesses in the economically distressed zone. The legislation has provided means for accomplishing real change. Warren County's largest town is well on the way to reinventing its identity as a major riverfront destination. Its special status as an Urban Enterprise Zone has generated a great deal of interest from business people from throughout the Northeast. But most of the heavy lifting in melding the town's rare mix of historical, cultural, and aesthetic assets into a new identity has come from within. Phillipsburg has rolled up its sleeves to brand its industrial heritage as a major component of its appeal as a cultural and recreational destination. At the confluence of the Delaware and Lehigh Rivers, the Phillipsburg area and its surrounding communities in both New Jersey and Pennsylvania are historic transportation hubs. Commerce was conducted on two rivers, three canals, five railroads, five streetcar and interurban railway companies, and numerous stagecoach, bus and truck enterprises. Phillipsburg was also the terminus of two historic trans-New Jersey turnpikes, and the home of a number of manufacturing companies directly and heavily involved in transportation. Phillipsburg has been selected as the site of the future New Jersey Transportation Heritage Center, a large-scale theme park deigned to preserve the State's history. 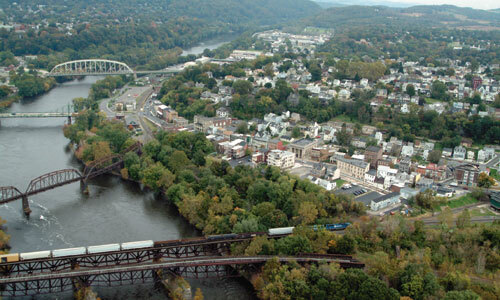 An aerial view shows several rail bridges (active and inactive), the Phillipsburg “Free Bridge” and the interstate toll bridge that straddle the Delaware River directly across from Easton, PA. The proximity of these assets to the town’s shopping district hold great promise for the town’s development as a heritage center and riverfront destination. The Phillipsburg Railroad Historians leased former rail property near the proposed main heritage center that they use for rail park activities. They have succeeded in the restoration and operation of the Centerville & Southwestern miniature scale railroad with more than one mile of track and other equipment. The miniature railroad and the small exhibit space at its embarkation point is one of several operating anchors for the Museum, the final scope for which will span several types of rail tracks, numerous examples of historic rolling stock and structures, and span nearly one square mile in size; truly a museum without walls. The Phillipsburg Union Train Station, recently deemed eligible for listing on the State Historic Register, was opened by the Friends of the New Jersey Transportation Heritage Center as an exhibit space restored it to its original appearance. passengers along the Delaware River. The Delaware River Steam Train Excursion was born with the acquisition of a Brill Model-55 gas-powered railcar known as a "Doodle Bug" that would carry passengers on the refurbished Bel-Del tracks along the Delaware River from Phillipsburg to Carpentersville, 4 1/2 miles south. The project took a giant step forward when the New York Susquehanna & Western Technical & Historical Society agreed to operate a steam train excursion along the route. NYS&W engine #142, one of several running mainline steam locomotives in the country, is no stranger to eager throngs of commuters to America's past. The non-profit Society, formed in 1988 to help preserve the history of railroading in New Jersey and New York, has already managed numerous recreational excursions while restoring several pieces of historic rolling stock. Steam train excursions run Thursday ­ Sunday from May through Labor Day. Passengers board at a station constructed near the Morris Canal arch, where the "canal that climbed mountains" began its trek across New Jersey. At the other end, a set of impressive, historic lime kilns near the Delaware River mark another fascinating component of regional history. Along the way, the route affords dramatic views of the river and a memorable one-hour journey for riders of any age. For more than a decade, Mark Portnoy, Executive Director for Phillipsburg's Urban Enterprise Zone (UEZ), has worked to bring the town back. The UEZ has facilitated the town's revitalization by offering facade grants, low-interest loans, sales tax exemptions and property tax incentives to attract new investment to the community. Phillipsburg's Urban Enterprise Zone enables area retailers to charge half of the state sales tax (3%) giving Phillipsburg an edge in retail sales. Equally important, the State allows Phillipsburg to keep the 3% collected by its merchants for reinvestment in the Town's economy. Strategic real property acquisitions, historic streetscapes and added parking are just some of the initiatives that are helping to attract savvy investors to open exciting new enterprises in Phillipsburg's charming buildings. Two free parking lot permits good at any municipal lot in town. Grant of up to $2,000 for new business sign. Business product or service featured on town's website for six months following opening. Eligibility to sell inventory at 3% NJ Sales Tax and full Sales Tax Exemption for business purchases. Portnoy has written scores of grants, attended hundreds of meetings, issued countless press releases, and been the common link between railroad historians, bankers, realtors, builders, retailers, artists and entrepreneurs. With arms full of data and incentives, he has campaigned, cajoled, sweet-talked, and nurtured; done everything he could to persuade prime candidates to come be part of the town's resurgence. "What sets us apart? We have a vision, a defined vision that's not artificial but one that comes from our history," Portnoy explains. "But beyond our legacy as a transportation hub, we also have resources. On a broader scale, Phillipsburg's revitalization has a solid basis in its classic, unspoiled architecture and attractive real estate values. The key is linking our riverfront to the central business district." Those links are becoming more and more evident. Portnoy has spent much of the past ten years finding ways to reinvigorate the town's infrastructure. The peeling paint on South Main Street has all but disappeared, replaced with gleaming storefronts; a French Patisserie, Italian Bistros, New-Age wares, antiques and collectibles, specialty furniture and home accoutrements. One 300,000 sq. ft. factory has been converted to an upscale tile store filled with displays and sample full-scale installations. And Phillipsburg has become home to a growing community of artisans. Has Phillipsburg turned the corner? "I'm overwhelmed trying to keep up with requests from prospective businesses," says Portnoy. "What I plan to do is go talk to successful businesses in other downtowns and see if they want to open a satellite operation in a burgeoning community, where they can sell their wares at 3% sales tax! I think we'll be successful in attracting existing businesses." Phillipsburg's trump card is an interstate synergy will give the town a tremendous boost in its attraction as a riverfront destination. Phillipsburg's sister city, Easton, PA., has established a number of major tourist attractions. 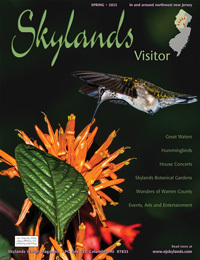 These include the visitors' center for the Delaware Canal & Lehigh Navigation National Heritage Corridor, the National Canal Museum, the Crayola Factory at Two Rivers Landing, and the Easton State Theater Center for the Arts. These attractions already draw about 300,000 people a year.